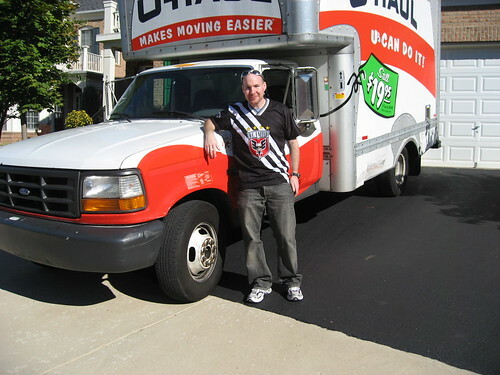 After a busy final day of packing, an uncomfortable night of sleeping on the floor listening to a domestic dispute at 2am, and a nightmare about large scorpions emerging from under my oven, I awoke to the unpleasant task of picking up my 14′ Uhaul truck. Around 8:15am, I drove to the local Uhaul location, where upon exiting my car, I was surrounded by guys who didn't speak English well, and seemed to be looking for work. I made it into the office, where I had the opportunity to hear a woman get in a loud dispute with the staff about a dolly (the response she got was rather rude). Luckily, everything was in order for me. As I got in my truck, the guy who accosted me earlier showed up again. He and another guy put something in the back. Perturbed, I got out, opened the rear, and found a small dolly. I told them I didn't want it, and took it out. I got in again to review my map, and the guy began to adjust my passenger side mirror, and though I appreciated the help, I'm still not sure why he proceeded to open the passenger door. I decided to look at the map elsewhere and sped off. The two movers (hired via emove.com) showed up a few minutes early, and went straight to work. They were about my size, and rather young, however very courteous, friendly, and efficient. Once my stuff was loaded, I realized I could've gotten by with a 10′ truck. 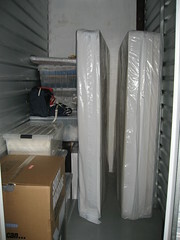 I also could've gotten by with a 25 square foot (vs 50) storage space, though it would've been tight. I think the reduction of possessions threw me off. After unloading at the storage unit, we dropped off two pieces of furniture at my friend Phil's basement, and made it to my parent's house to unload my TV and clothes with a few minutes to spare (I had hired/paid them for 4 hours). I managed to drive the rolling deathtrap back to where I got it, and was happy to get into my comfortable VW so I too could speed past the meandering amateurs driving Uhauls. I picked up a few things at my apartment, dropped off the keys, returned the cable equipment, and headed back to my parent's house for R&R (and a Guinness). By 10pm, I was completely exhausted, and fell right to sleep. The kind of sleep which you deserve after a hard day's work. Dave now you have more space to send things home,and your parents can put it in storage for you :) dont let space go to waste.. happy it went well and as planed.